Galvanized dropping pan for AH2424 hutch. Made from heavy duty galvanized steel with riveted corners and hemmed edges. Pans pull out for easy cleaning. Pan size 24in x 24in x 2.75in. Galvanized dropping pan for AH3036 hutch. Made from heavy duty galvanized steel with riveted corners and hemmed edges. Pans pull out for easy cleaning. Pan size 30in x 36in x 2.75in. Plastic dropping pan, 24in x 24in. Made from heavy duty plastic. Pans pull out for easy cleaning. Pan size 24in x 24in x 2in. 1 lb bag of wire cage clips. Use to assemble 14 to 16 gauge wire panels for rabbit hutches and pet homes. One package assembles 3-4 average size units. 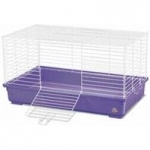 My First Home is the perfect starter cage for your Rabbit, Ferret or Guinea Pig! It snaps together in minutes without the need for tools. My First Home offers plenty of room for your favorite little critter, yet it is compact enough to place on a dresser or counter top. The deep plastic base prevents bedding from scattering while the white wire top makes for easy viewing and superb ventilation. My First Home offers plenty of room for your favorite little critter, yet it is compact enough to place on a dresser or counter top. The deep plastic base prevents bedding from scattering while the white wire top makes for easy viewing and superb ventilation. My First Home is the perfect starter cage for your Rabbit or Ferret! It snaps together in minutes without the need for tools. My First Home offers plenty of room for your favorite little critter, yet it is compact enough to place on a dresser or counter top. The deep plastic base prevents bedding from scattering while the white wire top makes for easy viewing and superb ventilation. 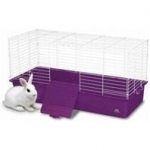 The pet lodge deep plastic tray home for rabbits and other small animals is ideal for in home use. Easy to clean, deep plastic tray helps contain bedding and litter. Top and front door access. Dual handles for transport. Kid friendly door latches. Rounded corners for safety. No tool assembly - sets up complete in seconds. Unique design provides versatile top and front door access. Easy to slide out and clean pan. Half inch grid mesh floor supports - hygienically protects rabbit&#39;s hocks. Bright zinc plated finish. 24in wire pop up small animal cage. Rounded corners and evenly spaced wires for hanging feeders and waterers.